Currently working on my new book – a sort of horrible histories for people who like textile history. And I found this source, a book about the extant records of a York pawn shop. I haven’t yet been to see the primary source, but have been working on some very similar, previously unpublished sources, I uncovered in various archives. 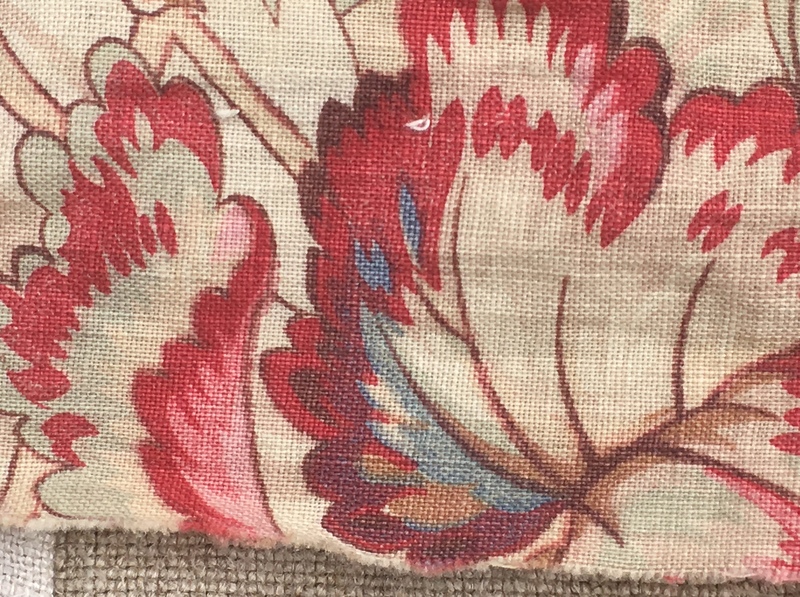 18thC or 19thC printed linen, own collection. Many workaday clothes were made from this kind of fabric. George Fettes was an Edinburgh man who ran a pawnshop in the late 1770s on Lady Peckett’s Yard in York. Pawnbrokers’ records, like debtors’, are often a fascinating insight into the lives (and clothing) of ordinary folk. In ‘The Worm-Eaten Waistcoat’, (self published, York, 2003), Alison Backhouse gave a compelling glimpse into late eighteenth and early nineteenth century York and its denizens. Pawnbrokers could sell any items that weren’t redeemed by the deadline. Although Fettes seems to have been a lenient man, often overlooking his own deadlines. A glimpse into the Pledge Book 1777-8 shows that some customers were frequent flyers, like Mary Metcalfe of Walmgate who pledged gloves 25 times. She was probably a glove maker, pawning her own stock, to survive in business. Occupations of pledgers varied and include: a joiner, dyer, a travelling woman, a chandler, a Trumpeter 11th regiment (York was full of soldiers; often garrisoned randomly in pubs in the city centre); , “the deaf woman”, – a “quack doctor”. Pledgers came from beyond the city walls, as well. Poor Betty Bridgewater travelled twenty miles from Kilburn with a counter pane, “very much worm eaten”. 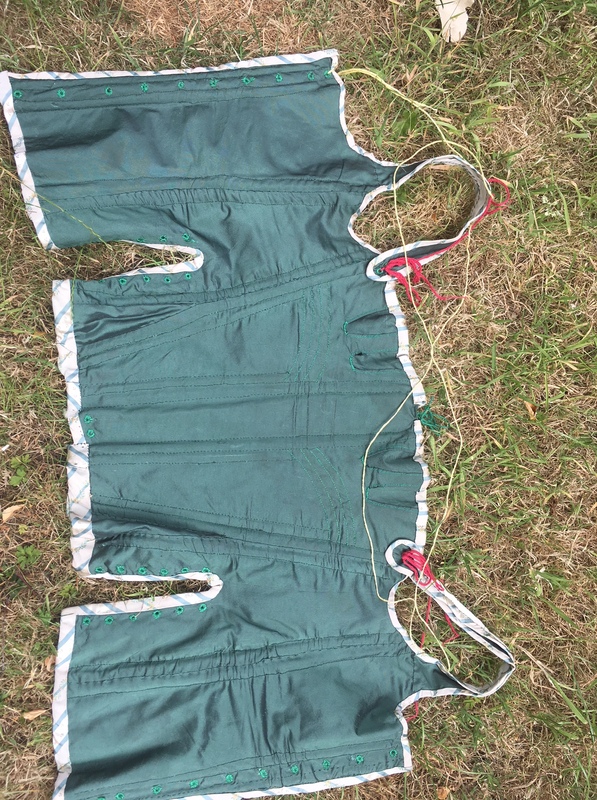 Kind-hearted Mr Fettes seems to have even taken in “worm-eaten” textiles. Which tells us something about him, but also the fact that they maybe still had some intrinsic value; textiles being so hard to produce that the vast majority of the population were walking round in secondhand clothing. A silver watch was pawned by the marvellously named Pendock Vame; an apprentice with Mr Firth of Coney St for 15 shillings on 18.7. 1777. The watch was redeemed but later sold because it was pawned again by John Turner of North St on 17th of November. Some of the clothing pawned was surprisingly personal. One common item of clothing often pawned were stays. My stays, copies of c. 1790s-1800. Silk, lined with linen. Hand-sewn. Luceted handspun silk ties. Here are just some glimpses of the clothes of eighteenth century York. one washing gown, one new tea kettle, one flannel petticoat, the yards of check, four yds if flannel also a Silk Petticoat Quilted. [Pledge by Thomas Callis out of Micklegate Bar 13/11/78. “Everlasting” appears to have been a thick, maybe boiled woollen fabric, also used for sailors’ coats]. A glimpse inside a pair of stays. Wooden busk. 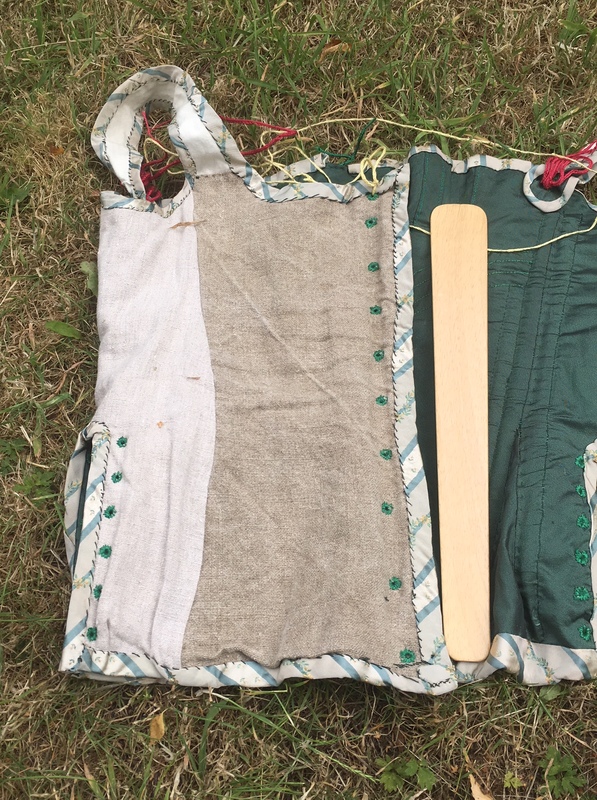 I didn’t bother to match the lining – which is what you often see with 18thC clothing’s linings. Holes for ties all hand-sewn. These would be worth pawning in the 1790s. Pawned by Elizabeth Firth of North St in 1778 – they were pawned for a shilling and a penny, and they were unclaimed (43). North Street was by the river and where many watermen and their families, of varying degrees of prosperity, would have lived. My favourite ancestor’s second marriage was at the church in North Street in the 1820s. All Saints has possibly the best medieval stained glass in York, even including the Minster – complete with zombies. Well worth a visit if you’re in the area. According to Alison Backhouse: “Saturday was the busiest day of the week for receiving pledges” (45) Followed by Mondays. These were also the busiest days for redemption of pledges; suggesting York weekends were quite fun. 1542 of the pledges were for just one shilling (5p) – 14% of the total number of pledges. A quarter of items would never be redeemed. George Fettes sold unredeemed items by auction. 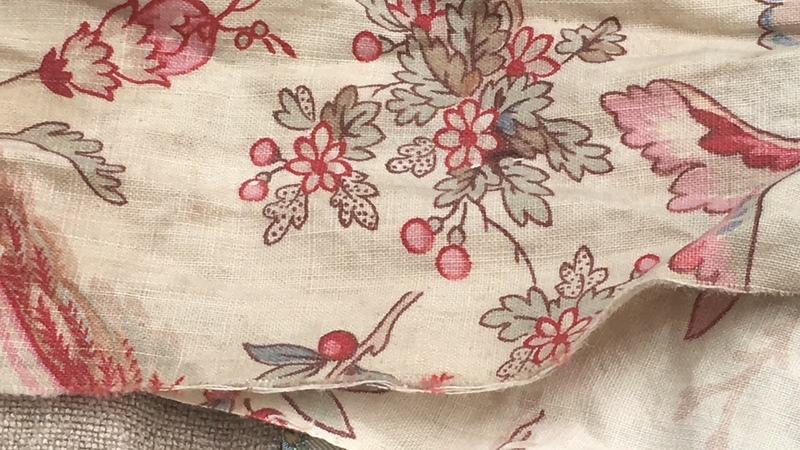 18thC or 19thC printed linen from my collection.